Is Sunday dinner/supper the most important meal of the week for your family? It was when I was growing up. I always looked forward to Mom’s pot roast, or fried chicken, or whatever special she had planned for the day. Sometimes Dad had to go to work, but I remember sitting down together as a family on most Sundays to enjoy Mom’s cooking. I don’t know why, but Sunday dinners are more casual for us now. I don’t often do big meals, and when I do I still try to keep them simple, but sometimes a celebration is in order. And this was a celebration meal, so I went all out and had bacon with my pork tenderloin. Yes, it’s a bit indulgent, but it also serves a purpose, keeping the tenderloin moist while it roasts. Trust me, if you like pig, you won’t regret it. And it’s still an easy meal and elegant meal. Pork tenderloins usually come in packages of two, though one is enough for our family. I prep both and freeze one for another meal, but of course use both if I’m cooking for a crowd. 1. Preheat the oven to 425° F/220° C.
2. Rub the seasoning mix all over the tenderloin. Wrap the bacon pieces around the tenderloin and pin in place with toothpicks. Place the roasting rack in the pan and coat with cooking spray, then lay the tenderloin on top. 3. Bake in the preheated oven until a meat thermometer registers 155 F, about 25 minutes. Move the oven rack to the upper third of the oven and set it for broil. Broil the meat until the bacon crisps, about 3 to 5 minutes. Remove from the oven and cover the pork with foil, allow to rest about 10 minutes. I have always felt that Sunday Supper was very important; great way to start the week fresh. I tend to make something a little more special on this day, and something that will move nicely into a busy Monday such as this tenderloin. I love the addition of rosemary in this rub as I would have not thought of adding with mustard. Great idea, that I cannot wait to try at home! 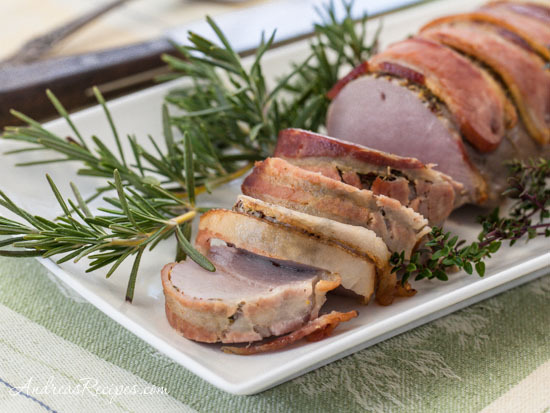 Thanks so much for mentioning my pork tenderloin recipe on your blog! I’ll have to give your version a try..it sounds and looks delicious!